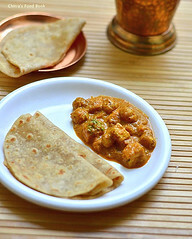 Recent days I have been trying varieties of Poori recipes for our weekend breakfast. 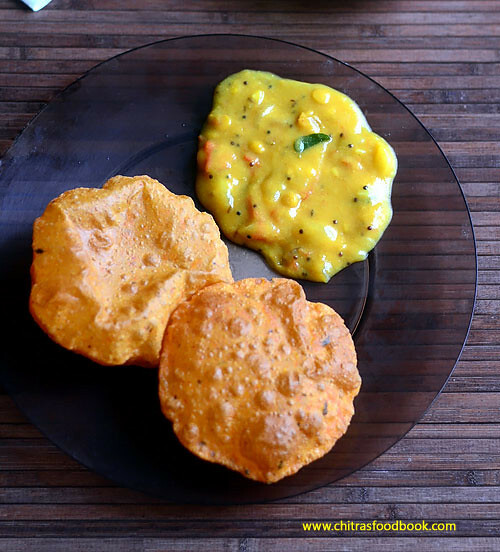 I have tried and posted palak poori, masala poori, beetroot poori, chola poori . This week I made tomato poori ( Tamatar ki puri in Hindi and Thakkali poori in Tamil) for the first time. I just combined the recipes of my regular poori & masala poori and tried this tomato poori by adding tomato puree.It came out really well with nice red color. 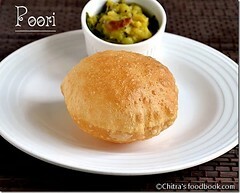 I prepared Bombay chutney as the side dish for this poori. It was a nice combo and we loved it a lot. 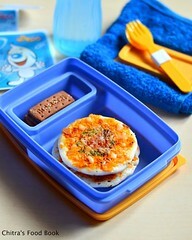 This poori can be packed for kids lunch box or for snack as it tastes good and soft even if its not hot. 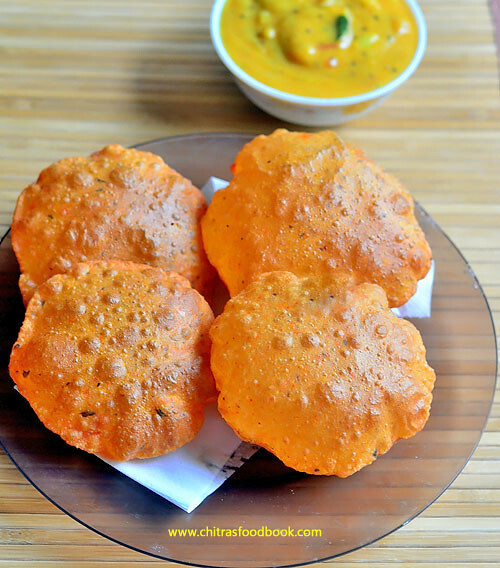 Do try this colorful poori variety for your family and let me know the feedback. 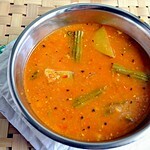 Tomorrow I will share the recipe of Bombay chutney. 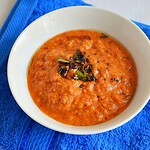 Today lets check out how to make this yummy tamatar puri recipe with step by step photos ! Wash and grind 2 tomato in a mixie jar without adding water. Grind it to make a smooth puree. 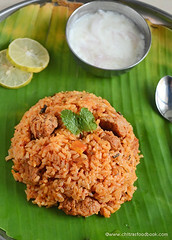 In a wide bowl or plate, take the wheat flour, tomato puree, rava, red chilli powder, garam masala powder, crushed kasoori methi, salt and ghee. Mix till crumbly.Remove the unground tomato pieces if any. Add water little by little and make a thick, smooth dough. Dough should be non-sticky.Knead the dough with your palm for 2-3 minutes and keep aside for 10 minutes. 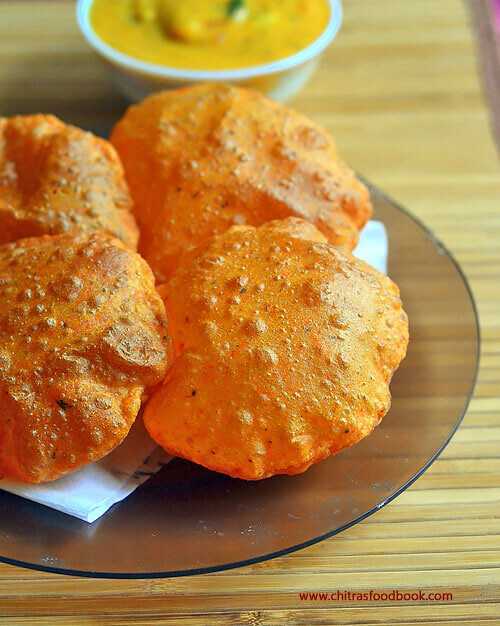 If you wish, you can make poori immediately. Make lemon sized balls out of the dough.Take one ball, dust with wheat flour and roll into thick, small poori as shown below. 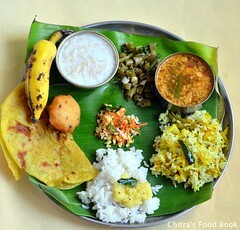 Thickness of poori should be more than chapathi. Only thick poori would puff up well. Heat oil in a kadai to deep fry the poori. Check its temperature by dropping a pinch of dough. If it rises to top immediately, oil temperature is just right.Make sure oil is not smoking hot. Keep the flame medium . Take a rolled poori, pat it with your hands to dust off the excess wheat flour and drop one poori in hot oil. When it starts to come up, just press it gently with the ladle. Poori will puff up well. Now flip the other side and cook for a minute. Remove in a tissue paper, drain the excess oil and serve hot with your favorite side dish. 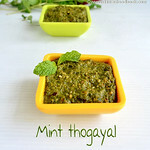 Adjust the quantity of masala powders as per your taste. Do not make the dough sticky. Poori will absorb more oil. 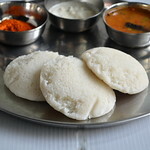 Adding rava helps to maintain the poori puffy for long time. Addition of ghee helps to keep the poori soft for hours. Roll the poori thicker than chapathi else it won’t puff up. Heat of the oil should be perfect to get well puffed poori. If the heat of oil is less, poori will sink in oil and drinks more oil. If the heat is more, the color of poori will become dark and may turn like a papad. 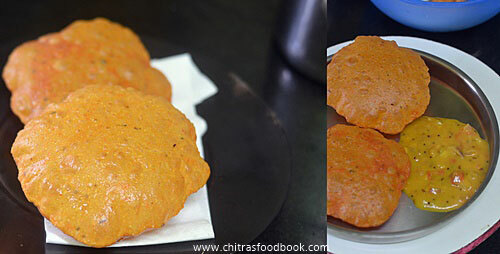 We enjoyed this yummy tomato masala poori with Bombay chutney ! 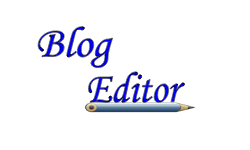 Thank you so much Suma :) Happy to see your feedback !